U.S. lawmakers of both political parties have told VOA they are not surprised by media reports that President Donald Trump's former national security adviser, Michael Flynn, will refuse to hand over documents pertaining to a Senate investigation of Russian meddling in last year's presidential election. 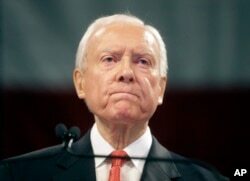 FILE - Sen. Orrin Hatch, R-Utah, speaks during the Utah Republican Party 2016 convention, in Salt Lake City, April 23, 2016. The Fifth Amendment to the U.S. Constitution protects Americans against self-incrimination, stating that no person can be compelled to be a witness against himself in a criminal case. Flynn was forced to resign in February after media reports surfaced that he lied about his contacts with Russia's ambassador. 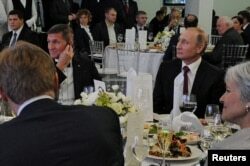 Last week, The New York Times reported that Flynn had informed Trump's transition team that he was under federal investigation for secretly working as a paid lobbyist for Turkish interests during the presidential campaign, but he was named national security adviser nonetheless. 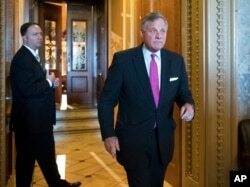 Senate Select Committee on Intelligence Chairman Richard Burr, R-N.C., leaves the chamber after a vote on Capitol Hill in Washington, May 10, 2017. By declining to cooperate with a congressional investigation, Flynn could be held in contempt of Congress, which could add to his legal woes. Leahy said it is too soon to speculate on that possibility. While former FBI director Robert Mueller takes over the Justice Department's Russia investigation, two congressional committees are continuing separate probes, including the Senate Intelligence Committee, which subpoenaed Flynn to turn over documents. Flynn previously sought congressional immunity from prosecution before testifying, although no one has granted it to him. Legal experts say that if he had complied with the subpoena for the documents, he risked being unable to invoke his constitutional right not to testify against himself. Flynn was paid more than $500,000 for his Turkish representation. He also was paid more than $30,000 for his involvement with Russian interests, including attending a 2015 dinner in Moscow celebrating the Kremlin-supported RT television network, where he sat next to Russian President Vladimir Putin.